What is the Speakers’ Bureau? It is a service provided by UC Marin Master Gardeners, who present research-based programs to garden clubs, business and civic organizations, neighborhood associations, schools and other groups on a variety of topics from the world of horticulture, sustainable gardening practices and more. Programs may include slide presentations and, for some subjects, demonstration and hands-on formats. Who will my speaker be? 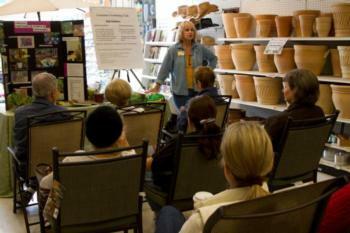 Programs are presented by UC Marin Master Gardener volunteers with knowledge, experience, and enthusiasm about the subjects on which they speak. A brief speaker biography will be provided in advance, if desired, for use in your publicity. Below is a list of current programs. If you don’t see a specific topic of interest, please contact us. • Alliums: Onions and Garlic and Leeks, Oh My! Talks typically run 45 to 60 minutes, with time for questions and answers. We may not be able to fill requests for groups of less than 15 people. Please contact us at least one month in advance for any speaker request.